The elvers - young eels - are one of the most expensive foods in Spain, but when you see them for the first time you may wonder why. They are not, to put it mildly, something that shouts: eat me! When they are alive they are slug and transparent, and they slide and twist like little snakes. After cooking they become opaque and resemble dead, flaccid worms, except that they are white and their eyes are two small black dots. But many delicious things do not look especially attractive, what really matters is the taste. And this is where everything gets weird. It is not that elvers taste good or bad. Actually they have almost no flavor, which is strange considering that they are astronomically expensive, more than 1,000 euros per kilo (just over US $ 1,200). Odder is that, according to legend, they were once so little appreciated that they were used as food for chickens and pigs. Many Spaniards find it difficult to understand how it is, that there are people willing to pay so much for elvers. Especially because according to the traditional recipe, you have to fry garlic and hot peppers in a large amount of olive oil and then add the elvers, a sure way to overcome their mild flavor. Mystery surrounds elvers, especially when it comes to their life cycle, which sounds like something out of a dark fairy tale. They live in fresh water, but they can breathe through their skin and travel long distances on land. They eat almost anything, alive or dead. Then, at 10 years old, more or less, they swim with the current in rivers of Europe towards the Atlantic Ocean and, somehow (still unknown to science), they find their way to the Sargasso Sea, some 5,000 kilometers away. At depths of more than 500 meters - a great feat for a creature that lives most of its life in shallow freshwater - they spawn to die, and their offspring float adrift on the Gulf Stream to Europe, a journey that takes at least two years. When elvers finally reach the Spanish Atlantic coast, fishermen armed with nets are already waiting for them. The season starts in November, and the best time to capture them is, of course, in the middle of the coldest, darkest and rainiest nights, and when the tide is strong and the water rough and cloudy. Although all elvers are incredibly expensive, the first batch to go out to auction every year is even more expensive. In 2016, the first batch weighed 1.25 kilograms and was sold at 5,500 euros (just over US $ 6,000). And yet the second batch, which weighed almost the same, sold for "barely" 1,070 euros (US $ 1,320). So what is the difference? They are the same elvers, bought with a difference of a few minutes, just one lot before the other. The most curious thing is that both lots were bought by the same person. If elvers once or never served to feed the cattle, there is no doubt that it was once the food of the workers in northern Spain. But that was when there were many eels, and therefore they were cheaper. When elvers became expensive and prices rose, a company called Angulas Aguinaga saw an opportunity. In 1991, using surimi, a paste of processed fish; they created imitation elvers, which are known simply as gulas. They look almost the same, but that's it. The gulas are softer and vaguely fishy. And yet they are so popular that you can find them in almost any food store in Spain. One reason that elvers are so expensive is that the dams and environmental degradation have affected the number of eels, and now they are considered in serious danger. Overfishing also has to do. In the past, live elvers were exported to China, where they were put on weight and marketed as mature eels, but that practice was banned in 2010. However, there is still a thriving black market. In 2017, the Spanish police discovered an international elvers trafficking operation that, when it was dismantled, had a gold bullion hideout, a million euros in cash, plus 2 million euros in live elvers on the way to China. Michelin-starred chefs also have a role in increasing prices. Manolo González, an award-winning food writer and historian from San Sebastian, as well as secretary of one of the most famous gastronomy clubs in the city, Cofradía del Ajo y el Perejil, explains: "When we were young, in the 1950s and 1960s, we ate lots of elvers." At the time, they were still considered too low-grade to serve in restaurants, but in the 70s, the great Basque restaurants like Arzak began to prepare them, and suddenly, the elvers were of high category ". It was not only that they were scarce, but that they were also fashionable. It was the perfect storm for the demand. The prices skyrocketed. "Exclusivity has always had a role in gastronomy," González explained. He compares it to buying wines of 5,000 euros a bottle, much more than its real value, but for some it is worth it, even if it is only to presume status. 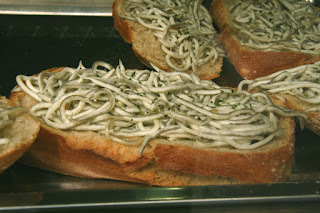 Although he admits that elvers do not taste much, González does enjoy his texture. "And for a food lover, on a special occasion, 80 euros for an entree is not completely out of reach." Although he does not prepare them himself due to its high price, the taste of the classic elver recipe with oil, garlic and hot peppers still holds good memories. "You can prepare the same dish but with spaghetti, we call it Angulas de Pobre (Elvers of the Poor)," he said with a touch of irony. "Try it, you'll see it's delicious!"